Decisionmakers and investors across the global are interested in prioritizing nutrition and health, and many believe that agriculture has the potential to do much more for nutrition if interventions and policies are structured accordingly. However, evidence on the real impact of nutrition-sensitive agriculture interventions is still lacking. The CGIAR Research Program on Agriculture for Nutrition and Health (A4NH) recognizes the need for high-quality research on the causal linkages of agricultural programs on improving human health and nutrition. 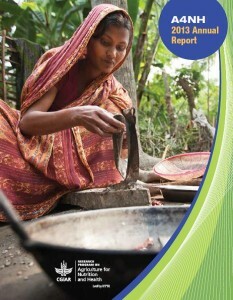 In the latest edition of A4NH’s annual report, covering our work in 2013, we highlight progress toward identifying and assessing the key drivers of change, the roles of different actors, and the potential for agriculture to improve the nutrition and health of poor communities around the world. Our 2013 progress included nutritional efficacy studies on biofortified crops implemented through HarvestPlus, accelerated food safety work—especially in scaling biocontrol efforts to stem aflatoxin contamination in Africa, and evaluations that assess the impact of development interventions on nutritional status and women’s empowerment. We hope you enjoy learning more about our program and its 2013 progress toward improved nutrition and health through agriculture, in the latest A4NH annual report. You may download a PDF copy of the report from the IFPRI website here, or read it in magazine-format below.